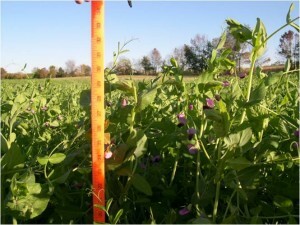 Austrian Winter Peas are a good cover crop for producing nitrogen. These peas have better cold tolerance than Canadian Field Peas yet still grow well when planted after wheat or other summer annuals. It’s preferred to plant them in August after the hottest days are normally past. Below I list the advantages and disadvantages of Austrian Winter Peas. 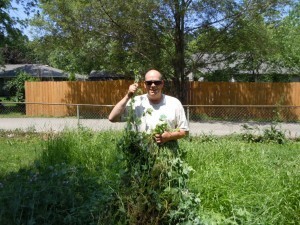 The peas in my garden plots overwintered and grew to over 5 foot tall this spring! Austrian Winter Peas provide a very nice source of Nitrogen. Aerial application provides challenges for stand establishment- but has worked! 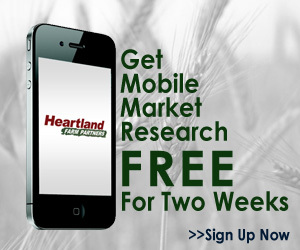 ← Cover Crop Selection – What to plant after wheat or other cereal grains? What is your experience with A. Winter peas, will be of value as a cover crop if flown into soybeans at leaf drop in Lucas Cty Ohio area? Will they get that 5 to 6 weeks of growth as mentioned above. The same question with crimsom clover. Flo, Flying peas into standing crops is pretty risky. I have seen it work pretty well…but only into good moisture (and it stayed pretty moist). Peas work much better incorporated to a depth of 1 to 1 1/2″ deep. On the other hand Crimson Clover works very well flown into soybeans or corn at the right maturity stage. The nice thing about Crimson Clover is that it most likely will live through the winter and produce more nitrogen in the spring as well. The peas might do that but crimson clover will be more winterhardy most years. HI me again I feed my goats and horse a mix of baled winter pea barley and oats.They way they ate it you would have thought they died and went to heaven.but this year my little pasture is useless and I am going to have to feed store bought even more than normal but if by some miracle I could plant something like this,maybe I still have time.I live in ne texas most of my soil is clay .have any advice. Jacquie, You are right, animals love to eat the mix that you had! The good news is that all of those are also great for building soil. I believe it is too late to plant peas at this late date if you want to graze them For soil building it might still work, but not for harvesting of grazing…they would be too small. I’ve planted Austrian Winter Pea in the Fall in SE Oklahoma and they were growing to 7 feet in May/June. Can I plant a winter pea and oat mix in July (after wheat is harvested) and get a forage harvest that same fall assuming proper weather provided? If so, on 45 lbs/a, how much yield can I assume either dry or wet hay? Does it ferment well? I am seeking a cover crop for the sole purpose of building the soil over the winter. I would till it into the ground for spring planting of my garden. Comments or suggestions would be appreciated. I have a CRP field in Huron County Ohio that I will moldboard plow on October 1. I will drill it with cover crop within a week or 2 after that, depending on weather. I definitely plan to plant cereal rye to hold the soil. Additionally, since it is going to corn in the spring of 2014, I am hoping to add a legume to fix some nitrogen “for free”. I’m willing to drill it twice to get this benefit. Do you think that Austrian winter peas is a good candidate or am I too late? We’re in zone 5a with an earliest frost date of 9/20 – I expect a “hard” frost in late October/early-November. I also have the possibility to run something through the small seed box when I’m drilling rye – maybe hairy vetch is an option? Or, do I give up on nitrogen altogether? What do you recommend? Thanks! Eric J.
hello, just thought i’d comment on all this fascinating work all you farmers in the states are doing with cover crops, no-till e.t.c. I was completely landless up until two years ago but now have a small plot roughly 50′ by 15′ for veg n’ what not..i’m basically a frustrated farmer but i do have my feet in the soil at last and can’t get enough of this soil health ‘revolution’. It really is awesome.. i decided to ‘no-till’ one year ago, had tried green manuring years ago but have really taken a quantum leap in my level of enthusiasm and ‘knowledge’ since discovering what you guys are upto across the pond..Just wanted to say thanks really to all you farmers for doing what your doing and sharing all this amazing knowledge..i’m just itching to get my covers in next year..cheers! Thanks James! Best of success over there! I was thinking of using the A Winter Pea for needed N. I live in S.C., very hot, so 1) when would be the best time to plant 2) can this be done year-after-year? Thanks in advance. Planting winter peas in late August through mid-late September in your region. You can plant them annually. Be sure to inoculate the peas each year you plant them. They do like cooler temperatures! I’m interested in planting some cover crops for this winter. I know it’s a little late already, so can you recommend some that may still work for east-central Texas? It’s quite hot and humid here so I think I met still have time to get a decent cover. I’m thinking of winter wheat and a legume such as Austrian winter peas or clover. Any suggestions would be greatly appreciated. Thank you. Peas and Winter Barley or Rye or Wheat would be very good. Also, Annual Ryegrass and Crimson Clover would be a great too! Stacy, It depends on where you live. I’d say a good rule of thumb is plant the peas 5-6 weeks before a killing freeze. The longer they grow the greater the benefit. Best of success! If grown with ryegrass and cut before peas bloom, for baleage, will peas have regrowth? 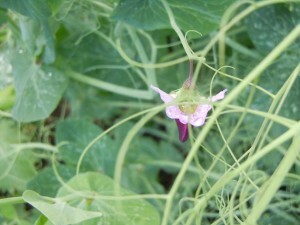 I am not sure when Peas will bloom in North Texas. Sorry…Usually peas do not regrow well after they have harvested. The regrowth would typically be very limited if any.